Now my wife bought these along with the fudge truffle ice cream cake back in March and they've just kind of been hanging out in the deep freezer, but I'm hungry, my morning has started all backwards, and I need something to reset me. This should work. That's how you print a wrapper! I try the shell first ofcourse and my initial impression is that it's almost fudgy. I sample it a bit more and a better description might be chocolate milk, Nesquik to be precise. It's got that flavor of when I put just a wee bit too much Nesquik in my milk. It's definitely different from other freezer aisle treats. Sure I could savor this bar, but let's bite in and reveal.... whoa, that is some bright white filling inside. Be honest, does the bright white filling scare you? Because it should. It's like some very dense cool whip and I'm not really a fan. It's not horrible or anything, but we're now so far removed from what I originally wanted that I am unamused. The ice cream has two problems. One is the reduced fat texture. I don't like it. It's unnatural. Two, is the flavor. It's like cake batter without the cake flavor. There is that familiar flavor/tingle you get from a cake flavor and to me that is unamusing when combined with the texture. Let me reset and will try this again on another day. On Second Scoop: Now in a very different mood and kind of looking forward to this treat, I dig in. Is it decent? Yeah. It's not a bad treat, and it's less jarring on the second try, but it could be much better. I think what continues to throw me off is the gummy texture of the ice cream inside. 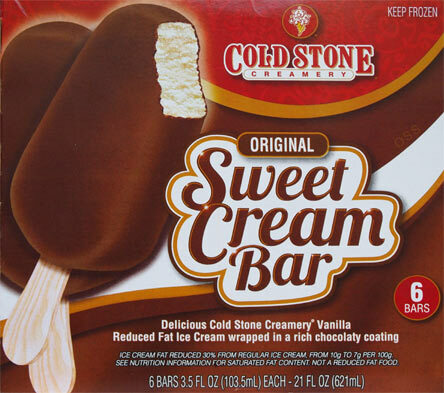 Cold Stone is such a quality product when fresh that it's hard to settle for the so-so treat with their name on it. Again, it's not horrible, but should it have the cold stone name on it? I gotta say no. 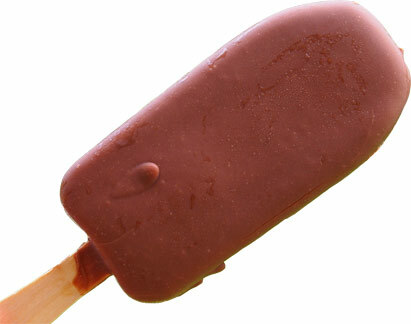 Until they put out the treat that deserves their branding, I'll stick with the excellent talenti gelato bar instead.